I had my first piece run in Canadian Business magazine last week. Pretty cool. It was kind of weird to see it in print so quickly because CB is a biweekly pub. Normally, I'm waiting months from the time I file a story to when it publishes. Wrote about how the local fast-food haunt Chicken on the Way has started opening up franchises in a big way. Co-owner Russ Dunn told me they go through about 1700 pieces of chicken on an average day! 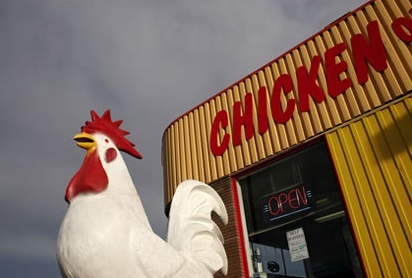 That's roughly 33 million pieces of chicken since they opened in 1958. That's a lot of poulet! In addition, this story gave me the chance to work with my former Alberta Venture editor, Mike McCullough, again. He also worked with me at AMPA as a board member before he moved back to Vancouver to take on his current CB gig. It was fantastic to work with an old friend again. Just like editors like to hang onto good writers, writers like to hang onto good editors!